One of the most notable findings in contemporary behavior genetics is that children growing up in the same family are not very comparable. Findings suggest that in order to understand individual differences between siblings it is necessary to examine not only the shared experiences but also the differences in experiences of children growing up in the same family. In the past decade a group of investigators has begun to examine the contributions of genetics, and both shared and nonshared environment to development. As with many new research endeavors, this has proven to be a difficult task with much controversy and disagreement not only about the most appropriate models and methods of analysis to be used, but also about the interpretation of findings. 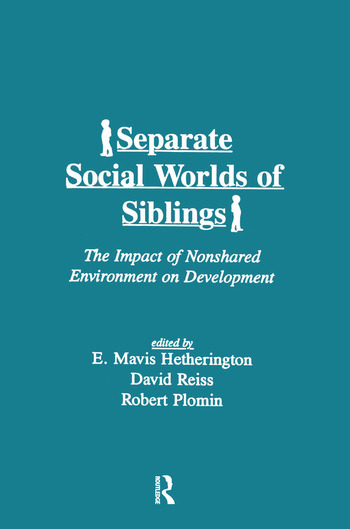 Written by some of the foremost scholars working in the area on nonshared environment, the papers in this book present their perspectives, concerns, strategies and research findings dealing with the impact of nonshared environment on individual differences in the development of siblings. This volume will have heuristic value in stimulating researchers to think in new ways about the interactions between heredity, shared and nonshared environment and the challenges in identifying their contributions to sibling differences. These papers should raise new questions about how to examine the contributions of genetic and environmental factors to development, with consideration given to the findings of this study of sibling differences and nonshared environment. Further, these papers may encourage a growing trend to integrate genetic and environmental perspectives in studies of development. Contents: Preface. R. Plomin, H.M. Chipuer, J.M. Neiderhiser, Behavioral Genetic Evidence for the Importance of Nonshared Environment. M.J. Rovine, Estimating Nonshared Environment Using Sibling Discrepancy Scores. D. Reiss, R. Plomin, E.M. Hetherington, G.W. Howe, M. Rovine, A. Tryon, M.S. Hagan, The Separate Worlds of Teenage Siblings: An Introduction to the Study of the Nonshared Environment and Adolescent Development. J. Dunn, S. McGuire, Young Children's Nonshared Experiences: A Summary of Studies in Cambridge and Colorado. G. Brody, Z. Stoneman, Sibling Relationships and Their Association With Parental Differential Treatment. M. Tejerina-Allen, B.M. Wagner, P. Cohen, A Comparison of Across-Family and Within-Family Parenting Predictors of Adolescent Psychopathology and Suicidal Ideation. D.C. Rowe, E.J. Woulbroun, B.L. Gulley, Peers and Friends as Nonshared Environmental Influences. C.K. Ewart, Nonshared Environments and Heart Disease Risk: Concepts and Data for a Model of Coronary-Prone Behavior. J.E. Deal, C.F. Halverson, Jr., K.S. Wampler, Sibling Similarity as an Individual Differences Variable: Within-Family Measures of Shared Environment. "For researchers interested in the differential experiences of children in the same family, I highly recommend this edited collection....this is well-written material which deals intelligently with the social worlds of young siblings, an alliance only recently appreciated and acknowledged as integral to family processes. I consider it a 'must read' for anyone interested in the social development of children and adolescents in their families." "...a concise book that is essential reading for anyone wanting to look at where developmental psychology is heading. These authors with their colleagues put forward the rationale for a new study that will be a classic in the field, as it will demonstrate empirically the richness and value of defining important links of non-shared environmental to developmental processes. We will never look at family environmenatl and developmental processes in the same way....Separate Social Worlds of Siblings....is a glorious Fourth of July display of fireworks. In other words, it is awesome! "This volume includes several new and compelling contributions to the literature on nonshared environment....recommended for researchers and students with some acquaintance with current issues in behavioral-genetic research."